Look what’s coming from Kia! It’s the new GT version of the popular Cee’d which will make its debut at the Geneva Motor Show in March. The new Pro_cee’d (Gedddit?) 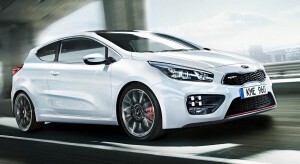 and the Cee’d GT are the most performance-focussed produced by Kia yet. We have a soft spot for the Cee’d range here at Firstvehicleleasing, especially for those drivers who don’t high performance or a head turning but simply need a car that goes from A to B without letting you down. Now it looks like the new Cee’ds will do that – and more! Especially since it looks set for taking on the VW Golf GTi with an impressive package. They have been designed and built in Europe and have quite strong design styles to help them stand out. There’s also dual-exhaust pipes and LED daytime running lights, which aren’t necessary, and Recaro seats and some nice looking red brake callipers. There’s also a new 1.6litre turbocharged which will help the sporty Cee’d, via a nifty six speed manual gearbox, to reach 0-62mph in 7.9 seconds. That’s a tad slower than the new Golf it aspire to overtake but it will firmer suspension than the normal Cee’ds and improved steering. Production will ramp up in May at the firm’s Slovakian factory and the Pro_cee’d will be on sale here in the summer with the GT following a few months later. Kia is being tight-lipped about prices and more detailed spec until nearer the launch but expect them to cost around £21,000 when the order books finally open. Kias built in Europe are great cars to lease because they are reliable and come with a great manufacturer’s package – check out how much you could save before you actually buy one! This entry was posted in Car Updates & Releases, New Cars, News and Views, Small Car, Sports Car and tagged caption, car, Cee, Cee’d, Europe, firstvehicleleasing, Geneva Motor Show, Golf, Golf GTi, GT, kia, Kia Cee, Kia It, Kia Pro_cee, LED, LS, MoT, price, Pro_cee’d, seat, speed, Sport, VW, vw golf, vw golf gti by Steve Lumley. Bookmark the permalink.